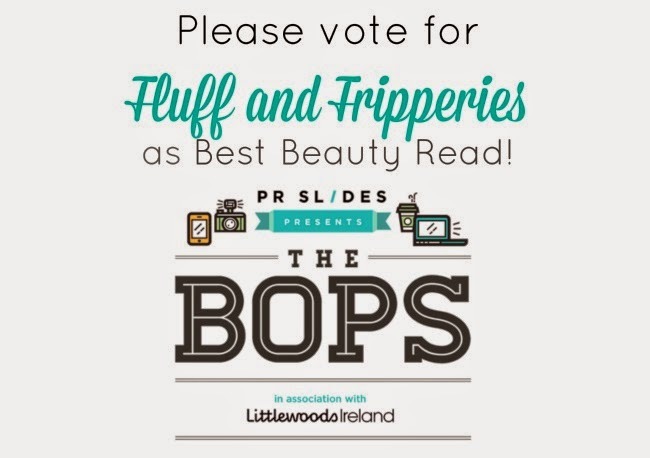 Have you voted in the BOPS (Blog and Online Publishing Awards)? I first heard about the BOPS when Karen from Lovely Girlie Bits posted about them, so I headed over to give her my vote - to find out I was in the running myself! Organised by PR Slides in association with Littlewoods, this is the first year of these awards and you can vote for your favourite Irish online writers and sites until Friday, 11th April. Since Karen's got my vote, I'd love you to consider doing the same for me! There are loads of other really worthy sites in the mix - like the fabulous Frillseeker in the fashion category - and regardless of who wins, the night itself sounds like a grand bit of craic. Fluff and Fripperies is up for Best Beauty Read which is the second category you'll come to - and don't worry, you can skip through any category where you don't fancy casting a vote. It takes less than two minutes to vote in all categories and you can do it here. Big love to all the other great sites on the shortlist - congrats and best of luck! And as a massive THANK YOU you to everyone for reading and supporting the site, make sure you come back this afternoon for a very exciting, WORLDWIDE giveaway - see you then!